Got Scrap? 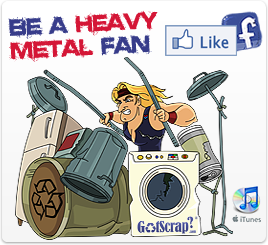 is offering Free iTunes to “Heavy Metal Fans” and & Others using their pick up service in August. Up until now, old appliances and other metal items have been dumped in city landfills across the country, which has greatly increased our carbon footprint. 1-800-GOT-SCRAP ensures that these materials are re-purposed thus preserving natural resources and reducing greenhouse gases. Typically, 1-800-GOT-SCRAP picks up such items from your house for $50. Those looking to earn cash may drop off their discarded items at an affiliated recycling center for cash. The items are then shredded, sorted into various pure metals (e.g., steel, aluminum, copper, iron) and shipped overseas to be re-purposed into new appliances and automobiles. SA Recycling operates 45 recycling centers in 3 states and expects that 1-800-GOT-SCRAP will expand beyond California and Las Vegas in the coming months. For a list of affiliated recycling centers, visit GotScrap.com. Also, make sure to “like” us on Facebook.